UAE is warming up for the New Year celebrations and festivity. We have compiled a list of events happening across the UAE to welcome 2015. Enjoy! NYE will be a combination of lounge and dining for loyal patrons and new customers who are looking to spend their New Years Eve in a sophisticated yet comfortable environment. Caramel’s resident DJ take over the decks. Prices for Dubai Dh150 for bar only, Dh300 dining and Dh450 for the cabana package. Prices for Abu Dhabi Dh100 for bar, Dh250 at the bar and lounge and Dh350 for the dining package. New Year’s Eve Party, buffet with live cooking stations, pasta & risotto station, homemade crepes and waffles station. Dh175 per person including soft drinks and Dh249 including one bottle of sparkling, half price for children 6-12 years old and free for children below the age of 5. Legendary’ New Year’s Eve, choose to dine inside or al fresco on the terrace and indulge in the international buffet with a festive twist. From 7.30pm to 3am and enjoy live entertainment while ringing in 2015 with views of the Dubai Creek. Dh480 per person, inclusive of buffet, soft beverages and selected house beverages (if booked before Christmas day), Dh580 thereafter. Close the chapter of 2014 and start the New Year, guests can look forward to enjoying an evening filled with sensational sounds and authentic flavours, enjoy the enviable view of Burj Khalifa haloed by a spectacular display of fireworks, while a DJ sets a celebratory mood for the outlet’s first New Year in Dubai. A three course NYE set-menu for adults alongside a children’s menu, with fireworks visible from the terrace. Executive Club: Ring in the New Year with a view of the firework displays from Burj Khalifa while enjoying a feast from the 61st floor, Dh375 per person or enjoy an internationally inspired buffet with live-cooking stations and for Dh 220 per person at the Metro! Restaurant. New Year’s day lunch at Metro! featuring live-cooking stations for Dh120 per person. Nosh: New Year’s Eve dinner buffet from 6.30 pm to 10.30pm, featuring international favourites and live cooking stations. The buffet is priced at Dh190 including soft beverages or Dh600 per person with all you can drink package where guests can dine then stroll down to the ubk bar to continue the party. Le Metro Restaurant: The New Year’s Eve dinner buffet from 8pm, children in the age group 6 – 12 years can avail the feast for Dh100, adults have two options to choose from; Dh195 per person inclusive of soft beverages or Dh365 per person, which includes free flowing house beverages. Kris: New Year’s Eve Gala dinner from 9pm, gold package priced at Dh950 per person that includes the 5-course set menu and free flow house beverages or Dh1,200 per person that also includes free flowing premium beverages. New Year dinner starting from Dh150 only, special festive buffet, bar, raffles prizes to win, kids’ entertainment and more. Rock in the New Year by the beach, a night full of entertainment with live band, Russian dancers, led show and gala dinner with live cooking stations & BBQ. The buffet will include a variety of international dishes including sushi and sashimi, rib-eyed steak and a selection of desserts. Dh 399 per person. NYE 2015, International buffet with unlimited selection of house beverages. Live music and band . Tickets Dh299 with unlimited soft beverages, Dh499 with unlimited beverages and Dh1,199 for couples with one beverages bottle, children below 6 enter free, children between ages 6 and 12 pay half price. Celebration this new year’s eve in Ras Al Khaimah!! Guests will have the options to start their evening at Seven Heights restaurant at an open buffet or dinner at Meat Point for Dh150 per person. The entertainment square will be the meeting point for the counting down to the first moments of the New Year. Children have their own New Year’s Eve party at the Rixy Club, that includes a mini disco, magic show, circus acrobats and more. Maison Mathis: Welcome in the New Year with the biggest house party, offering an assortment of food including live cooking stations and unlimited selected beverages, house DJ, fire-works and a glass of bubbly at midnight. From 8pm until late. Dh550 per person. Prime 68: End the year on a high note at Prime 68, enjoying views from the 68th floor with a 6 course set menu, 1st seating from 6-8.30pm is Dh650 for food only, Dh950 including house beverages, 2nd seating from 9pm-1am is Dh850 for food only, Dh1,250 including house beverages and toast at midnight. The Courtyard: Celebrate in style to this year’s best tunes with our resident DJ. A six-course set menu, which includes roasted turkey, leg of lamb and a variety of Arabic specialities, all served to your table. A large variety of hot and cold meze, as well as desserts. From 8pm, Dh650 per person inclusive of soft beverages, Dh950 per person inclusive of unlimited select beverages. Tresind: New Year’s Eve nine course modernist menu priced at Dh595 per person, includes a coupon for a beverage at midnight. Entertainment by DJs Andy and Gavin, surprise flash mob and a belly dancer. Watch fireworks from the 42nd floor at midnight. Welcome the New Year on the beach with family and friends, three packages for guests to enjoy while celebrating the New Year. From 8pm until 12am, you can choose from the Silver, Gold and Platinum packages, thereafter continue at the cash bar until close. Silver consists of a four-course inclusive of soft beverages for Dh599 per person, gold includes house beverages for Dh899 per person and the Platinum includes of select premium beverages for Dh1,099 per person or book a five-seater lounger for Dh2,500, that includes two beverage bottles of your choice from the menu. Wrap Up 2014 007 Style, the meal features fine de claire oysters, Canadian lobster and more. Finish your last meal of 2014, with desserts such as Chocolate explosion with vanilla ice cream. Diners are invited to unleash their inner secret agent, dressing to the nines a la James Bond and his femme fatale. The best dressed secret agents at this black tie dinner will be duly rewarded. Priced at Dh550 per person, includes a beverage on arrival. Celebrate New Year’s Eve, a new outdoor setting that overlooks Burj Khalifa. Feast your eyes on an unforgettable experience with the best seats in town. 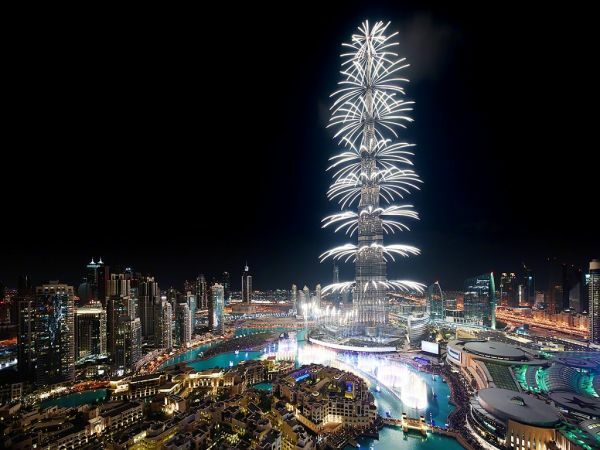 Watch the fireworks at Burj Khalifa. Enjoy the sounds played by the DJ and experience fresh seafood at the live seafood station, steaks from the live carvery and a wide variety of farm-to-table cuisine. Revel in a full-course buffet and unlimited soft beverages. From 8pm to 2am, Dh550 per person, valet parking included. 3in1: New Year’s Eve lavish evening, enjoy a six-course set menu, where main dishes include an array of seafood, a live carvery and succulent steaks served to your table, while a variety of international cheeses and hot and cold meze are available on a buffet. Party the night away to the tunes of our international DJ until the wee hours of the morning. From 8pm, Dh650 per person inclusive of soft beverages, Dh950 per person inclusive free-flowing select house beverages, Dh4,000 for private cabana for up to 4 people. New Year Packages a la carte or Ebisu menu for lunch, and Welcome the New Year at Zuma for dinner. Reservations from 9.30pm onwards will be offered a la carte with a minimum spend of Dh850 per guest or diners have the option of choosing the New Years Eve Tasting menus of Dh850 or Dh1200 per person. For Zuma Bar table bookings from 9pm, there will be a Dh2500 minimum spend for up to 5 people maximum. A festive bar bites menu is also available on the night. Live music with DJ Adrien Callier & friends in Dubai and music with Margo Sahara in Abu Dhabi. New Year’s Eve revelers can choose from three venues ¬- Ingredients will be serving international celebratory cuisine from Dh499 per person, while an Asian inspired feast will see in the New Year at Pachaylen from Dh600 per person. Bid farewell to 2014 and welcome 2015 with a celebration under the stars, at the poolside setting. Dance the night away to disco and rock n roll classics from Emily and the ‘LOL Party Trio’ followed by the feel good vibes of UK DJ and enjoy an assortment of beverages at the open bar from just Dh200 per person for soft beverages or Dh750 for premium and French beverages from 9pm – 3am. Party goers wanting to countdown to 2015 in dazzling style can do so, at the respective resorts, as the entire island goes into celebration mode. New Year’s Eve celebrations start from Dh850++ including soft beverages or Dh1,150++ including an open bar, where you can enjoy the music of ‘Rome Antiques’ at Desert Islands Resort & Spa, the sounds of the violin by ‘Olga McMillan’ at Anantara Al Sahel Villa Resort or the tunes of the saxophone played by ‘Vera Barnett Schuster’ at Anantara Al Yamm Villa Resort. Celebrate the arrival of a new year under the stars on the beach, with live music from a DJ, indulge in snacks, free flowing beverages starting from Dh500++. New Year’s Brunch, enjoy the first day of the year and savour a gourmet brunch at The Café, starting from Dh450++. Jazz&Fizz: New Year Eve Glam Party, toast to 2015 while enjoying the music from the resident DJ and live band. Dh600++ per person including canapés pass from 7-10pm and open Bar with premium beverages all night. From 10pm, Dh450++ per person VIP package including unlimited premium beverages . Entry Dh100 per person inclusive of one beverage. Kick off the party with a buffet including live cooking stations and a selection of international favourites as well as a seafood spread. A five piece band and a DJ will entertain. Dh650 per person, children below 6 years dine free and those between 6 and 12 years enjoy 50 per cent discount. The Royal gala dinner, live music from a 26-piece band, delicacies as far as the eye can see, the evening begins at 7.30pm with canapes, beverages and welcome drinks before the live entertainment kicks off at 8pm. The highlight of the night will be the fireworks show at midnight. Dh3,200 for adults, Dh2,400 for guests 12-17 years, Dh1,600 for guests 11 years old and under, with children 0-3 years old free. Welcome the New Year 43 floors up with perfect views of all the fireworks. Dh1,500 per person with unlimited indulgences all night long, a dinner buffet with grilled favourites, desserts and more. Cabana: A lounge-style gala dinner, sway to the tunes of the DJ, as you savour a selection of tapas and sushi; relish grills prepared at a live charcoal grill or indulge the sweet tooth at a crêpe station. Fireworks show at midnight and toast new beginnings over a bottle of complimentary beverages, from 7pm. Dh2,200 per person or Dh16,000 per VIP Cabana, seating 8 guests. Na3 Na3: Usher in the New Year in style with the sights and sounds of the Orient, savour a buffet of festive specialities, 7pm to 2am. Priced at Dh850 inclusive of soft beverages, Dh1,150 including house beverages and Dh1,500 including select beverages and free access to Cabana to watch the fireworks display from 11:45 pm until closing. The Act: Executive head chef will bring a food experience with an innovative five courses festive dinner menu composed with lots of Peruvian influences. Guests will experience international performers who will take to the stage throughout the night with 70s, disco and rock’n’roll music. Once the clock hits 12, watch the Burj Khalifa’s fireworks from The Acts terrace. Dh1,000 minimum spend per person. Spend New Year’s Eve at the enchanting resort can celebrate at the Ballroom Gala dinner from Dh1,399 per person, the Al Waha Gala dinner from Dh1,399 per person, or Suhail from Dh1,750 per person before seeing the night sky filled with fireworks as the clock strikes midnight. New Year’s Eve Gala, experience an enchanting culinary journey, live entertainment and fireworks display as the New Year’s unfolds along the beach. The evening will start at 7pm and continue until 3am. Welcome beverages at the marble dome accompanied by a saxophonist from 7pm to 8pm, followed by dinner, guests will then welcome the New Year with a grand fireworks show display across Emirates Palace terrace and beach, continue the celebration into the early hours of 2015 with live music and entertainment performances and the unique grooves of our resident DJ. Dh2,750 for gala dinner. Minimum spend of Dh450 for à la carte menu in BBQ Al Qasr and Mezlai or Dh850 for New Year’s Eve special dinner in Sayad and Mezzaluna. New Year’s Eve gala, where an international buffet will entice while an eight piece band entertains with a live show, ringing in the New Year with fireworks on the sea view terrace. Stilt walkers, dancers and performers are sure to delight in the spirit of the legacy of Mrs Astor, while a children’s area will provide a safe space to the littlest of revellers. Dh1300 per person for food only, beverage package at Dh399 per person.